Dental implants replace missing teeth using titanium posts or frames in place of the tooth’s natural roots. The implants are surgically placed so that they fuse to the jawbone, providing a secure foundation for your fixed or removable replacement teeth. Endosteal dental implants are the most common type and are placed directly into the jawbone, using posts to support the new teeth. Subperiosteal implants may be the better choice if you have a shallow jawbone. This type of implant uses a frame-like structure that is placed beneath the gums but on or above the jawbone. Each dental implants treatment plan is customized to the individual. To determine how much your dental implants cost will be, schedule an appointment with our implant experts. We’ll conduct an examination and assessment to determine the implant option that’s best for you. Then we can present you with an estimated affordable dental implants cost. While implants may initially cost more than other replacement options like dentures and bridges, many patients find implants to be a worthwhile investment due to their many advantages, such as comfort and durability. Does Dental Insurance Cover Dental Implants Cost? Most dental insurance does not cover the full cost of dental implants. However, your insurance company may offer dental implants insurance, depending on your plan and the reasons behind your tooth loss. Discuss the details of your condition with our experienced implant dentists and your insurance provider to determine the cost of dental implants with insurance for your case. Most companies that provide dental implants insurance still will only cover a small percentage of the procedure. We realize that most patients will be paying out of pocket so we strive to provide affordable dental implants in Baltimore with our flexible financing options. The precise steps of a dental implants procedure can vary, depending on your unique needs and whether you receive endosteal implants or subperiosteal implants. Typically, dental implant surgery is done on an outpatient basis in several stages. First, the metal posts of the implants are placed into the jawbone. After that, you’ll need time to heal. It could take several months before the process of dental implants can be completed. You may receive a special temporary denture to wear during this time. Your surgeon will finish the dental implants procedure by putting abutments, which are extensions of the implant’s metal post, in place. Finally, you’ll receive your new teeth. 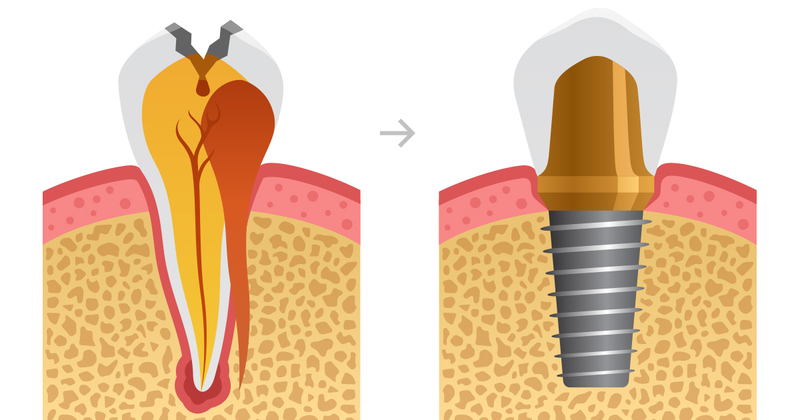 Dental implants procedure pain is not an issue for the majority of patients since the procedure is performed with the assistance of local anesthesia. They look and feel like healthy, natural teeth. You feel better about yourself when you feel good about your smile. They don’t slip or slide like dentures. You can chew all types of food with confidence. They’re designed to be durable. With proper care, your implants can last a lifetime. They’re good for your health. Implants act just like teeth and stimulate the bone of the jaw, preventing the bone deterioration that would otherwise occur when teeth are missing. Dental implants care after surgery is typically aimed at managing any minor swelling or discomfort you may experience. You can stay comfortable during the healing process by eating soft foods and taking over-the-counter or prescription pain medication. Once you’ve healed completely, caring for dental implants is just like caring for natural teeth. You can help your implants last for a long time by brushing twice a day and flossing once daily. As always, visit us for routine cleanings and exams. Who needs dental implants? Many people who are considering dental implants in Baltimore have missing teeth but either can’t or don’t want to wear dentures or bridges. You are a dental implants candidate if you have one or more missing teeth and are willing to make the time commitment to the dental implants process. However, you’ll need a full assessment by one of our experienced implant dentists to determine if dental implants are the right option for you. Factors we need to consider include the health of your gums, the condition of your jawbone and the state of your overall health. Dental implants are an excellent choice for tooth replacement, but how long does a dental implant last? That answer can vary from ten years to a lifetime, but exactly how long dental implants last depends largely on the patient’s lifestyle and attention to oral hygiene. Regular brushing and flossing will help to keep the gums and bone surrounding your dental implants healthy. If you have more questions about dental implants, please call our office in Baltimore to schedule a consultation today. Could the Affordable Dental Implants Maryland Wallets Love be Right for You? The staff are so wonderful! They are engaging and really take time to educate you so you can achieve optimal oral health. Love it there!